In what could be considered the first hint of the proverbial light at the end of the Virginia Avenue Tunnel project, CSX has announced that starting sometime in the next few weeks--perhaps as early as October 2, though one might wonder if playoff baseball might impact the timeline--it will be closing the southbound lane of 3rd Street at Virginia Avenue for approximately four to five months, just as it did for a shorter period of time back back in March of 2016. This closure is to allow for the demolition of the temporary deck over the still-under-construction north tunnel, which will then allow the roof of that tunnel to be built. Then work can begin on "installation of the new, final roadway features" on Virginia Avenue itself, first in the blocks just east of 2nd Street and then working eastward (which will mean more deck removals and temporary traffic flow changes/closures in coming months). Traffic coming south down 3rd Street north of the freeway will still be able to make the right onto the freeway entrance ramp. As with the previous closures, pedestrian access along 3rd Street will be maintained, as will access to the driveway to the Capitol Quarter houses on the front lines. Fourth Street will be the main southbound route from north of the freeway down into the neighborhood. Enjoy my map (sorry, CSX, my maps are easier to read than yours), and read the CSX presentation for more information. I may have said this before, but all these temporary closures really haven't been too bad. At least for me. JD - any news on the Whole Foods front? Seems awfully quiet over there. Nope, no news. Though I do wonder if all of the tunnel construction is impacting the timeline--not exactly a lovely landscape to open into right now. But I have no info one way or the other. I cross under at 4th everyday and no, it hasn't been bad. Even VA Ave itself with the two-way traffic hasn't been bad, and I thought that would have been a real problem. I don't live right on the front line though. If I did, I think I'd have a different opinion. October 4 is the current date for closure, according to an electronic sign at 4th & K.
I hope the detour signage is better than the last time they used this traffic pattern. I saw cars going south on 3rd a number of times, usually after making a left from Virginia Ave onto 3rd. I have a nearly front row seat for the 37 L demolition, and I thought I'd report that so far today, it seems that two dumpsters worth of stuff has been removed. Also, I can just make out the NAB HQ future site, and it seems like a lot of dirt removal is going on these days. Bower is finally above ground. 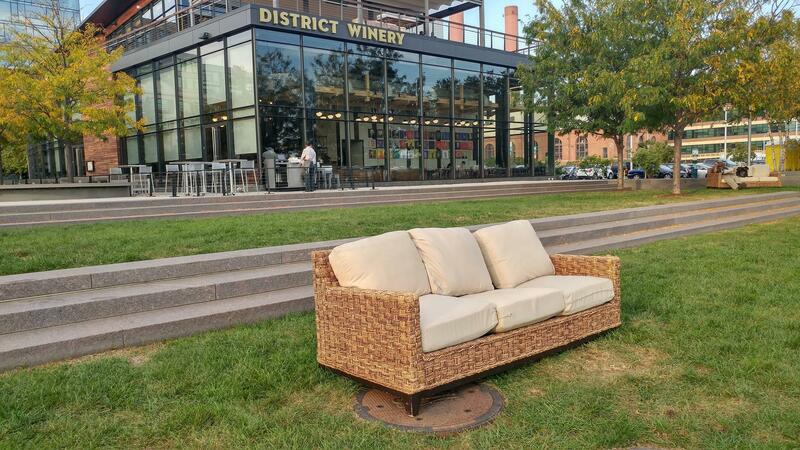 Anyone know what's up with the couches and chairs in Yards Park? Deliberately placed there or somebody just dumping furniture when moving out of their apartment? @RMP-- is there any good stuff? I might have to do some dumpster diving. @202_cyclist Judge for yourself. Dogs have definitely been marking these up though. The Washington Post has an article about the future of the Bullpen. Doors for Cava opened again today - looks like more progress towards finalized finishes. Opening before end of October? Hmmm. Re: the future of the Bullpen article.
" “The good news is we’ve been working really, really hard for the past year negotiating a lease for a permanent Bullpen that is very close to where we are now,” said Blair, who hoped to be able to share additional details about a permanent space for The Bullpen in the coming weeks. Architectural plans for the venue include two floors with an outdoor roof deck and garage-door windows that open to preserve as much of the outdoor vibe of the original Bullpen as possible." @Alex Your URL didn't work. What are you hinting at? Ok, enough beating around the bush. The only property that meets those criteria is the small parcel at the corner of first and N, the one wrapped around by the Hampton Inn. No inside information here, just reading between the lines. @alex b that would be a great spot, but much foot print, unless they built up significantly! The 49 L Street SE parcel is now on the GSA auctions website for bidding. The opening bid is $5M. We should have a Go Fund Me account or a JD Land happy hour to raise funds to purchase this property. I thought I saw some news a while back but have been out of the loop. Anything going on with 7-11 yet on south capitol. Was it sold? Bunch of folks touring 49 L Street St. just now. From October 3rd through 8th a group of truckers is planning to protest governmental regulations on the number of hours a truck driver can drive and the institution of electronic monitoring devices, called ELDs. Sources and social media show that the protest activity is scheduled to be on the National Mall around the Ellipse area and the Department of Transportation Building located near the Navy Yard (1200 New Jersey Avenue, SEWashington, DC 20590). The truck drivers have staged trucks in the Virginia and Hagerstown area. While there are plans to bring people in via personal cars, on October 5th there is a call to bring the trucks through the city beginning at 7 am. The potential driving route is I-495 to I-395, to I-695. From I-695 to South Capitol Street, SW, to M Street, SE, to New Jersey Avenue, SE, to 1st Street, SE, to Potomac Avenue, SE, to South Capitol Street, SW, to Washington Avenue, SW, to Independence Avenue, SW, to 17th and Constitution Avenue, NW, to 14th Street, NW, to I-395, and back to Hagerstown, Maryland. There have been permits issues for 100-200 people. The truckers were out in force in JDLand this afternoon, circling DOT while blasting their horns. We'll see what the rest of this week brings. Ampersand, on the route I think they left out N St, meaning they'll turn right on New Jersey rather than left. That takes them past DOT. Then right on N St, left on 1st, and around to South Capitol on Potomac. I question the effectiveness of trying to get the public and DOT on their side by loudly blocking traffic. No progress on the Whole Foods, but at the Agora building site they have put in street landscaping and trees along S Capitol Street and today paved the space in front of the WF entrance and installed stone/granite decorative blocks. Sorry - I meant New Jersey Avenue. Parc Riverside Phase II construction resumes tomorrow, per an e-mail today. Get your final morning swim in early at Lake Zika while you still can. There are floorplans on the Bower website. I like how JD's post above links to a tweet, and a reply to that tweet is a link back to this post. Very meta.